Bergdorf Goodman is a luxury department store on New York’s Fifth Avenue right next to The Plaza hotel. It looks really intimidating since it’s SO fancy but don’t worry, it’s not so scary inside. Take the elevator to the seventh floor and it lets you off right at the entrance of BG Restaurant. 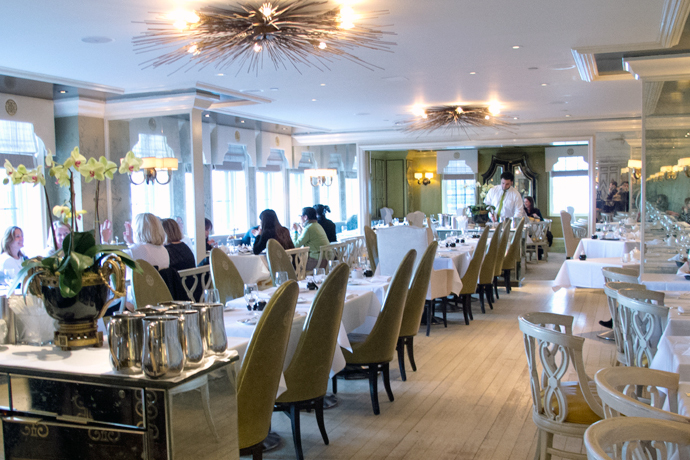 The restaurant is the perfect setting for ladies who lunch. The decor is gorgeous (The wallpaper! The whisper chairs!) and the view of Central Park is stunning. It’s been increasingly harder to find afternoon teas in the city for under $50 so I’m happy the BG Restaurant is keeping it reasonably priced. 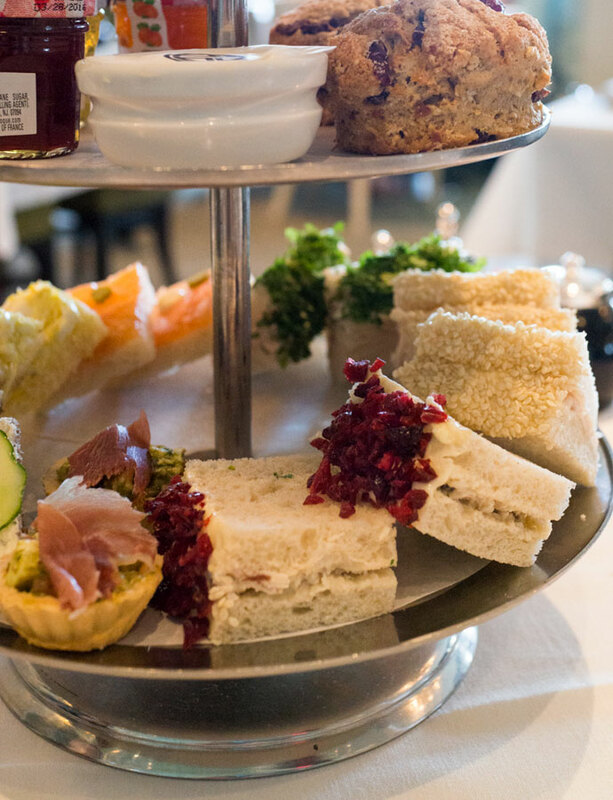 Afternoon tea is a light meal consisting of three courses and tea. The three courses are all mini portions of food and small bites. The first course is tea sandwiches and savories, the second course is scones with clotted cream and jam, and the final course is sweets. As it’s a set menu, you don’t pick the individual food items but rather, you get everything listed. The one thing you do get to pick is the tea. 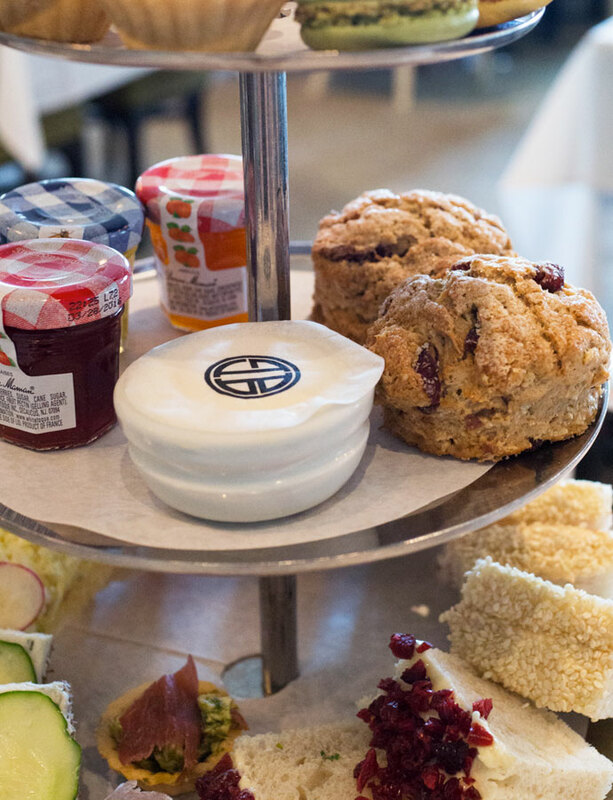 Everyone at your table orders their own afternoon tea and the pricing is per person. 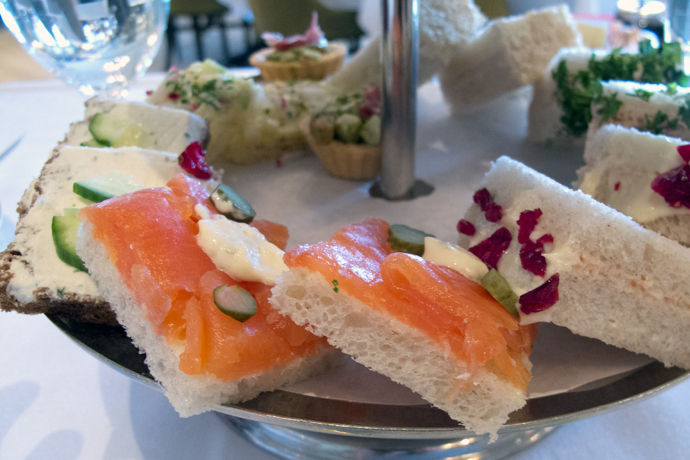 Does Bergdorf’s Have More Than One Kind of Afternoon Tea on the Menu? Yes, BG Restaurant serves two afternoon teas. There is the BG Tea Service (the traditional on a three-tiered tray) and the BG Tea Service Royale (comes with Champagne). How Much is Afternoon Tea at Bergdorf Goodman? 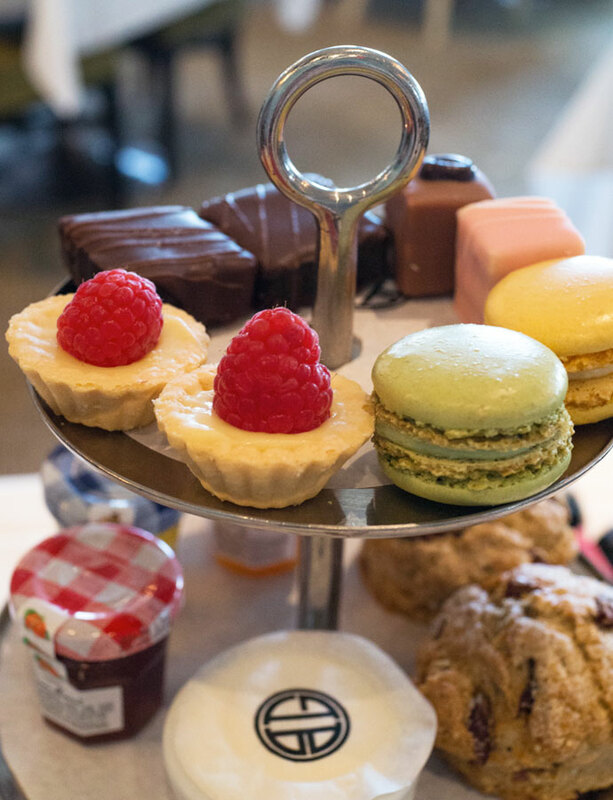 The BG Tea Service is $45 per person and it’s the classic afternoon tea with tea sandwiches, scones, and petite sweets. 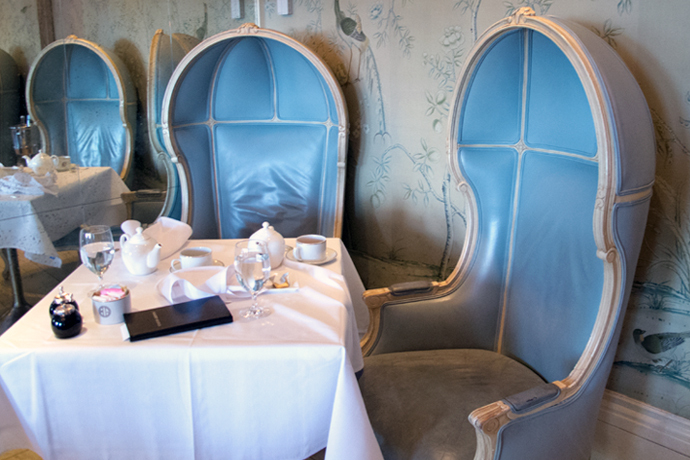 The BG Tea Service Royale is $62 per person and it’s the BG Tea Service with Champagne. Not required but recommended. I always make reservations for any afternoon tea seating, especially for BG Restaurant since I like to request the high-back whisper chairs when making the reservation. 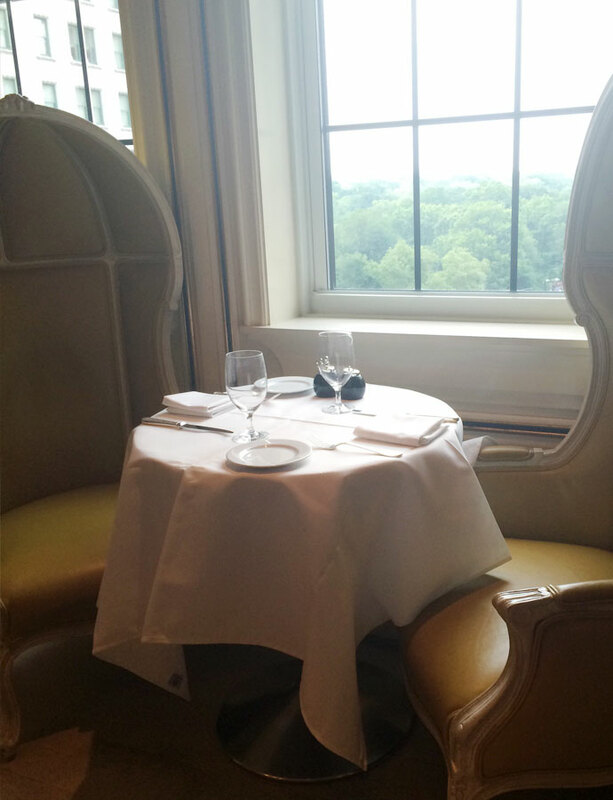 When making the reservation for two, ask for the tall-back whisper chairs for an intimate tea experience. The tables by the windows are way too close together. What Do I Wear for Tea at Bergdorf’s? No dress is stated so I would stick with smart casual. You can do jeans (preferably dark and not ripped) but look put together. How Long is Afternoon Tea at BG Restaurant? Afternoon tea usually lasts about two hours. Take your time to enjoy the experience. What Time is Afternoon Tea at the Bergdorf’s? 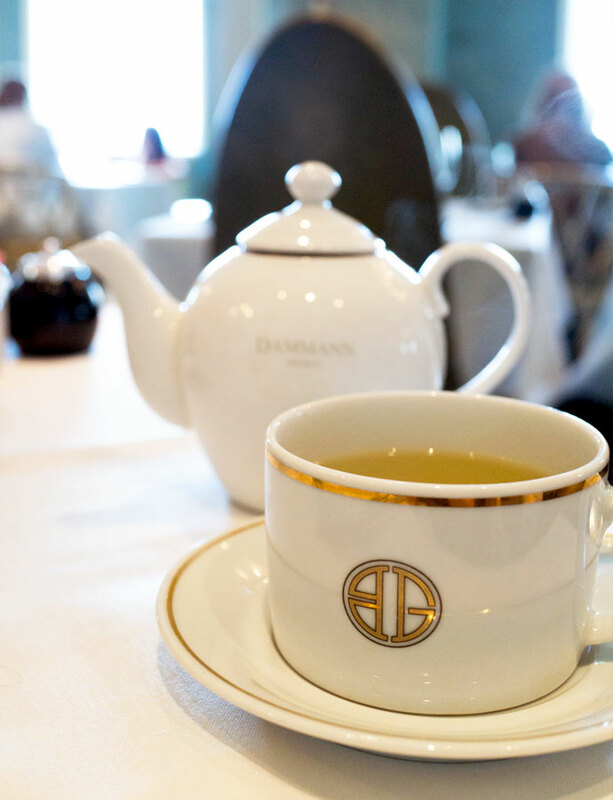 Tea service is daily from 3PM – 5PM. The restaurant closes at 5PM on Sundays so don’t make too late of an afternoon tea reservation or you may feel rushed. 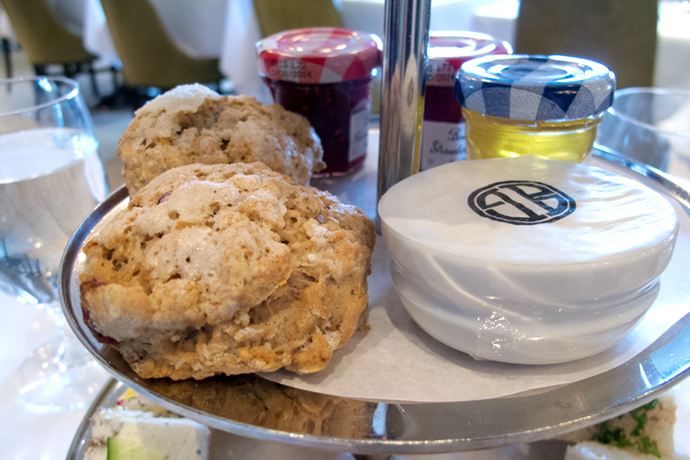 How Does Afternoon Tea at Bergdorf Goodman Work? BG Restaurant at Bergdorf Goodman just does one type of afternoon tea (well, two if you count the one with Champagne) and it’s priced per person. 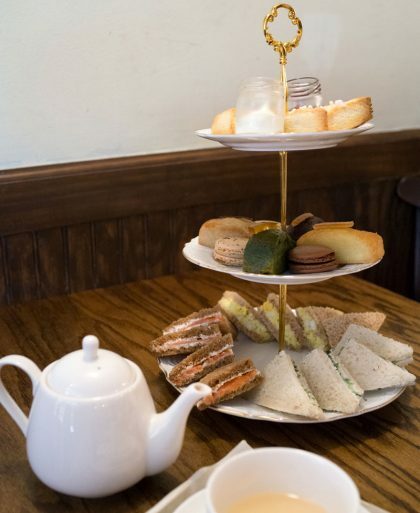 Each tea service comes with three courses served on a three-tiered tray made up of tea sandwiches, scones, and sweets. The only thing you need to pick is the tea itself. There’s a tea selection on the menu and you can pick one of the teas listed. The tea will come out first followed by the three-tiered stand with all three courses. 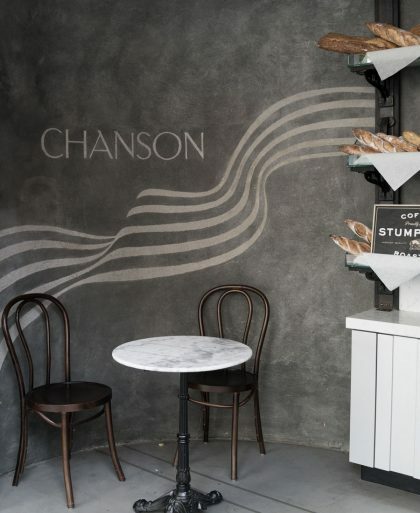 The restaurant is very pretty with such lovely details that gives it a very luxurious feel. I ALWAYS request the blue high-back whisper seats toward the back of the room that line the wall when I’m there having tea for a party of two. The tables by the window, especially, are too close together for my liking — it feels like communal seating. You may not get the Central Park view by being away from the windows but it feels way more intimate in the blue chairs. Just take a look out the windows before you leave! The BG is a restaurant, so the room isn’t exclusive to afternoon tea service. With afternoon tea service only from 3PM – 5PM, they did rush us at the end when it was getting close to 5PM. Everything on the tea menu is a blend. I like to see at least a couple of whole leaf tea options, so I’m knocking off a star. 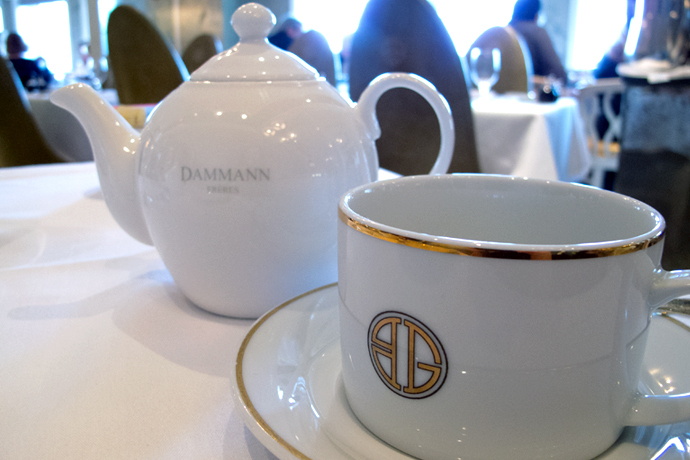 Dammann Frères tea is served and there’s a succinct tea menu with just 10 teas listed but they all sounded great. These dainty, two-bite tea sandwiches were very good. Tasty, fresh, and at six tea sandwiches per person, plenty to keep you full. On the second tier were scones. One per person, which is a great portion size. The scone had a light sugary top and the texture was great with just the right amount of crumble. I love the extra touch with the BG logo on the Devonshire cream cover. Four little sweets per person and they were good, but nothing was memorable. 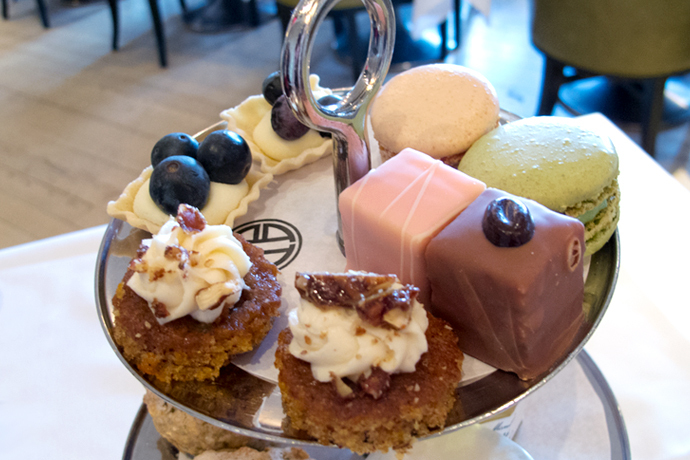 At $45 per person, this is a great afternoon tea experience. It’s one of my favorites and one I recommend to people from out of town since the location and views are fantastic. The restaurant’s decor hasn’t changed at all since 2013 — no complaints, the room looks timeless with just the perfect amount of frou frou. Tea has always been Dammann and the selection has been pretty much the same. Why change something when it’s great? The tea sandwiches have changed slightly but it’s pretty much the same as it was then. Back in 2013, the tea service was $35 per person. I could have taken this photo last week! Same tasty scones served the same way. Sweets are also pretty much the same. A question, please. Exactly how dressy do you need to be for tea at Bergdorf Goodman? I plan on being in NYC soon and would like go there. As a tourist, I will probably be dressed in pants, possibly Ugg boots, and a North Face type coat. Similar dress will be all I have on this visit. Do you think this is acceptable? I booked a reservation here & then found out they raised their prices to $45!!! Decided to go to the Mandarin Oriental instead (going tomorrow! ), hope it’s great. Hi Casey, yeah, the prices for afternoon tea have gone up quite a bit the last couple of years. Enjoy your tea at Mandarin! Do you know if the price is still $45 person? I’m planning to go there on Sunday and I’m debating if I should go here or Ladurée in soho since it’s only $39. Between the two which one would you prefer? Hi Sofia, according to their website, it’s still $45 per person. I would recommend Bergdorfs over Laduree since Bergdorf’s has been running tea service for a long time and know what they’re doing. I’ve found service at Laduree Soho very slow and inattentive.